Mark your calendars. The Long Center for the Performing Arts just announced its 2017 Summer/Fall Season of programming and we can’t wait. This year, they’re excited to offer a refreshed approach to season tickets that they feel confident their patrons will embrace: they have split their annual program into two seasons—Summer/Fall and Winter/Spring—to allow for more shows during the year, a shorter window of upfront commitment, and a simpler process for becoming a season ticket holder. There’s a stellar line up of shows and Austin premieres this season, including the Tony Award-winning and critically acclaimed musical Fun Home, live-score movie screenings of Star Wars: A New Hope and Terrence Malick’s The Tree of Life as a part of their new “Live-To-Picture” series, a conversation with Pulitzer-Prize winning journalist and New York Times Op-Ed columnist Maureen Dowd, and programming perfect for the whole family with our “Season of Cheer” series featuring holiday favorites Rudolph the Red-Nosed Reindeer and A Christmas Story: The Musical. Called “A rare beauty that pumps fresh air into Broadway,” by the New York Times, and “Exquisite. An emotional powerhouse,” by the Chicago Tribune, Fun Home is the winner of five 2015 Tony Awards including Best Musical, Best Score, Best Book, and Best Direction. Based on Alison Bechdel’s 2006 best-selling graphic memoir, Fun Home introduces us to Alison at three different ages as she explores and unravels the many mysteries of her childhood that connect with her in surprising new ways. A finalist for the Pulitzer Prize, Fun Home is a refreshingly honest, wholly original musical about the private life of families and seeing your parents through grown-up eyes. FRI, 8/11 – 8 p.m. SAT, 8/12 – 3 p.m. & 8 p.m.
SUN, 8/13 – 2 p.m. & 7 p.m. Alluringly low-fi, this troupe of theatrical artists are not just puppeteers, but creators of otherworldly landscapes through a striking combination of live actors, old-school projectors, and silhouette magic. Join us for the Austin premiere of Lula Del Ray, the story of a girl living on a vast desert plane who embarks on a hypnotic journey to meet up with a beloved country music duo. WED, 9/13 – 7:30 p.m.
THUR, 9/14 – 7:30 p.m.& 10 p.m.
Dell Hall, September 30, 7:30 p.m.
Part coming-of-age story and part divine commentary, Terrence Malick’s star-studded and slow-burning art film, “The Tree of Life,” sparked a dialogue within the industry about memory, the meaning of life, and the role that film can play in representing those ideas. Enchanting and dissonant, Alexandre Desplat’s score brings a haunting depth to the film, supported by the dramatic Romantic-era compositions of 19th-century titans like Mahler, Brahms and Smetana. Screening with live score performed by Austin Symphony Orchestra and Chorus Austin. John William’s legendary “Star Wars” score didn’t just enhance a great story, it gave life to an entire galaxy. From “Binary Sunset” to the “Imperial March,” the themes of “A New Hope” ushered in a renaissance of film music, the likes of which Hollywood had never seen before. Join us for a special screening with live score performed by the Austin Symphony Orchestra in honor of the 40th Anniversary of this most celebrated film. WED, 10/11 – 7:30 p.m.
THUR, 10/12 – 7:30 p.m.
Dell Hall, July 7, 8 p.m.
Coinciding with the newly released The Legend of Zelda: Breath of the Wild and Nintendo’s new Switch, The Legend of Zelda: Symphony of the Goddesses returns to the Long Center stage on July 7 for one performance only. Now in its fourth season and featuring new music and video, the concert comes to life with a 66-piece orchestra, 24-person choir, and a reimagined score that draws from previous Legend of Zelda games, including A Link Between Worlds, Twilight Princess HD, and Majora’s Mask 3D, while still paying homage to such classics as Ocarina of Time 3D and A Link to the Past. Dell Hall, August 23, 8 p.m.
Hailing from Utah, The Piano Guys have become an internet sensation by way of their immensely successful series of self-made music videos, leading to over 500 million YouTube views. Including their innovative multi-handed version of One Direction’s “What Makes You Beautiful,” and a gorgeous reinvention of the hit song “Let It Go,” from Disney’s Frozen, The Piano Guyscontinue to wow fans with their ingenious mash-ups, genre-bending arrangements, and ability to meld the worlds of Mozart and Adele so seamlessly. Rollins Studio Theatre, August 30, 7:30 p.m.
Austin native Carrie Rodriguez is a fiddle playing singer songwriter who approaches her country-blues sound with an “Ameri-Chicana” attitude. Her latest release, “Lola,” takes her back to her ranchera musical roots and was hailed as the “perfect bicultural album” by NPR’s Felix Contreras. With her Texas twang and unique mix of language and Mexican Ranchera melodies, Rodriguez’s culturally blended music is effortless and exceedingly timely. Part of the Long Center’s Concert Club series. Rollins Studio Theatre, September 16, 8 p.m. Hailed by Rolling Stone Magazine as “a genre unto herself,” composer, guitarist, and recording artist Kaki King performs her latest work, “The Neck Is a Bridge to The Body” – a simultaneous homage and deep exploration of her instrument of choice. In this bold new multi-media performance, Kaki deconstructs the guitar’s boundaries as projection mapping explores texture, nature, and creation. With nine studio albums and now “Neck,” Kaki’s whole body of work comes together with a natural overarching and evolutionary theme that is impossible to overlook. Rollins Studio Theatre, October 25, 7:30 p.m.
Jazz artist Jeff Lofton – together with his groups The Jeff Lofton Trio and his Electric Thang – has quickly become a household name around Austin’s low-key bars and jazz lounges. Lofton arrived in Austin in 2007, blowing the underground scene away with his Miles Davis tributes and original compositions. Through word of mouth and continued presence in the jazz festival scene, Jeff Lofton’s trumpeting has become the jazz sound of the city. Part of the Long Center’s Concert Club series. The favorite TV classic soars off the screen and onto the stage in this beloved adaptation. Come see all of your favorite characters from the special including Santa and Mrs. Claus, Hermey the Elf, the Abominable Snow Monster, Clarice, Yukon Cornelius, and of course, Rudolph brought to life! FRI, 11/24 – 4 p.m. SAT, 11/25 – 11 a.m. & 3 p.m.
City Terrace, November 24, 10 a.m. – 1 p.m.
Rollins Studio Theatre, December 20, 7:30 p.m. Composer and bandleader, Graham Reynolds, along with some of Austin’s best musicians wreak musical havoc with an explosive set of holiday favorites. By playing most of them in a minor key, Reynolds and his band bring a new perspective to these season standards. Get ready for a set that is raucous, rocking, beautiful, introspective – and everything in between. 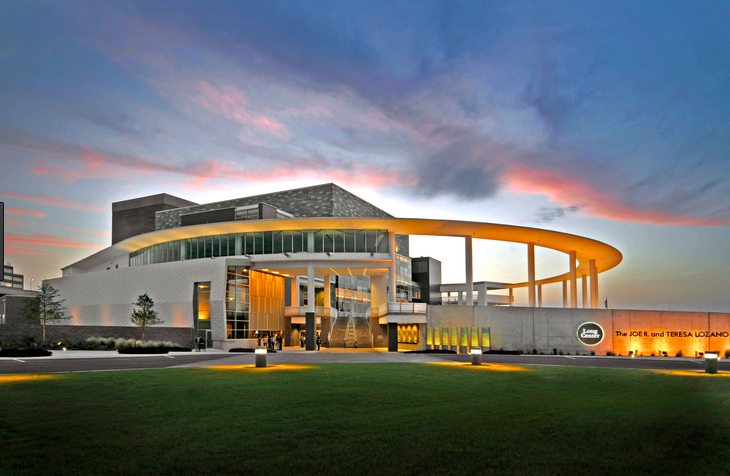 Part of the Long Center’s Concert Club series. After a smash-hit Broadway run garnering three Tony-Award nominations including Best Musical, this Christmas classic returns for another year. Based on the perennial holiday movie favorite, the story takes place in 1940s Indiana, where a bespectacled boy named Ralphie wants only one thing for Christmas: an official Red Ryder Carbine-Action 200-shot range Model Air Rifle! FRI, 12/29 – 8 p.m. SAT, 12/30 – 11 a.m., 3 p.m., 8 p.m.
SUN, 12/31 – 1 p.m.
Dell Hall, October 21, 2 p.m.
Dell Hall, Saturday November 18, 8 p.m.
Pulitzer Prize-winning journalist and Op-Ed columnist for the New York Times, Maureen Dowd, and award-winning author and the Times’ Chief Washington Correspondent, Carl Hulse, will examine the state of the nation one year following the most divisive presidential election in American history. Join us for an evening of incisive dialogue as Dowd and Hulse discuss how we got here and what lies ahead.